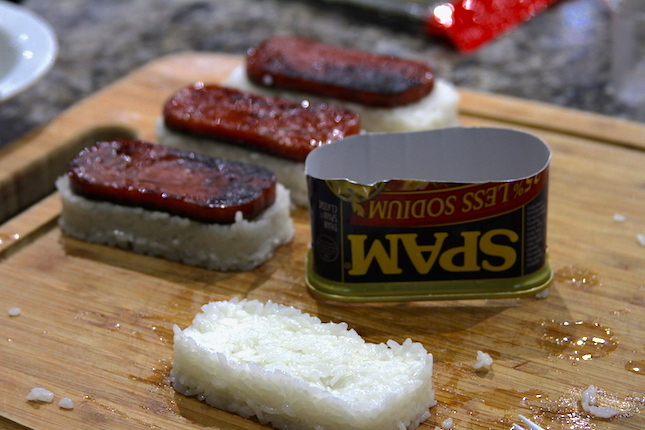 Slice the spam into 8 equal slabs. Place in a container or bag with enough Kim’s Teriyaki Sauce to coat all surfaces. 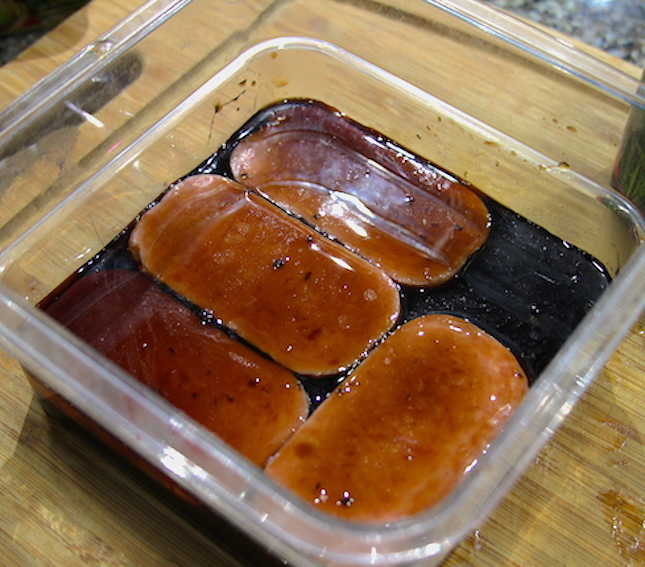 Marinate in the refrigerator for one hour. Make the sushi rice. Place the rice in a container and cover with water. Swirl the rice around then strain. Repeat this process until the water is clear, 3-4 times. Combine the rice and 2 cups water in a medium sauce pan and place over high heat. Bring to a boil, uncovered, then reduce heat to low and cook for 15 minutes. Remove from heat, but keep covered for 10 minutes more. Combine the vinegar, sugar and salt and mix. Fold the vinegar mixture into the rice. Cool to room temperature. Preheat your Yoder Smokers YS640 to 225ºF. Remove the spam slices from the marinade and place directly on the second shelf of the smoker. Smoke for 30 minutes. 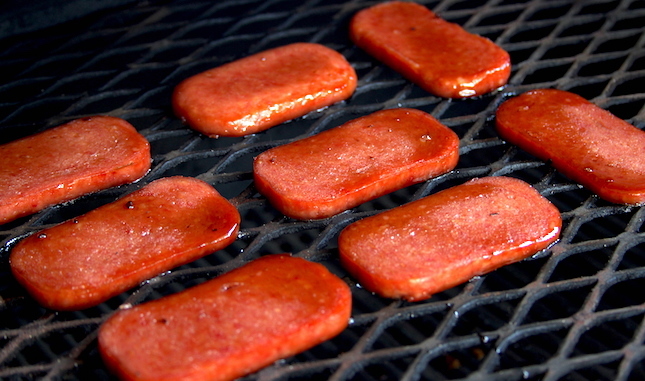 For a crispier texture, finish by pan searing the spam slices. Whisk together the eggs. Heat an oiled Lodge Logic 12” Cast Iron Skillet over medium-low. Add the scrambled eggs. Cover the skillet with a lid and let cook without stirring. When the eggs are cooked through, remove from heat. 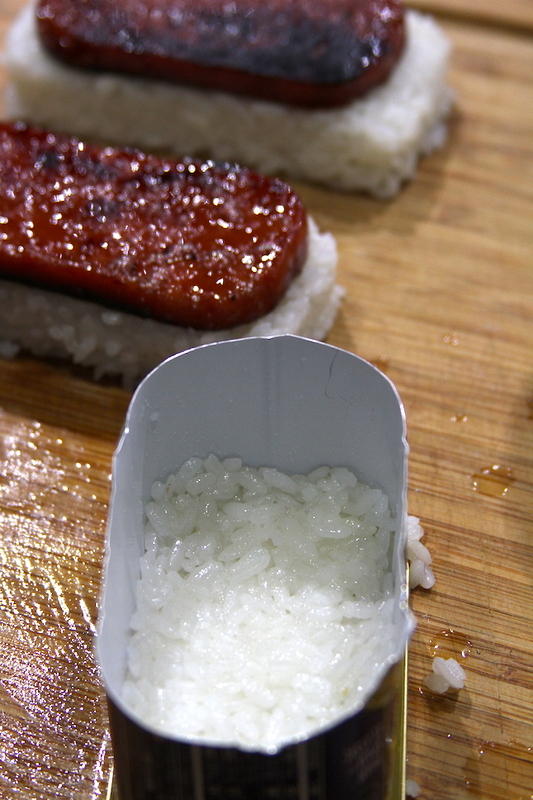 Using a Musubi mold (or the top half of a spam can), stuff a layer of the cooked rice into the mold and press to form an even rectangle. It helps to work with wet hands and a wet mold. Remove the rice from the mold. 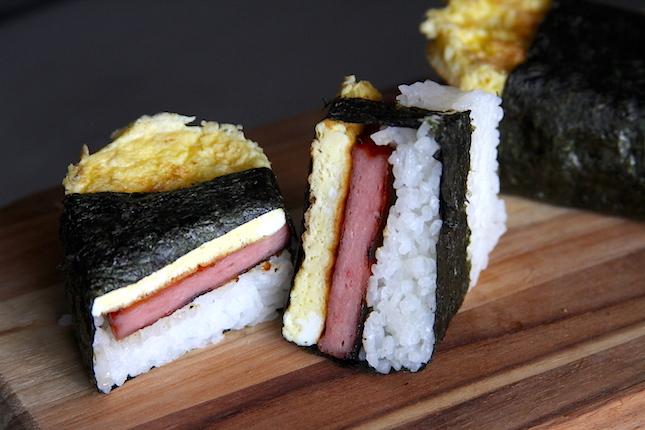 Top with a slice of spam, then cut a rectangle of egg to match the size of the rice and spam, and stack the egg on the spam. Place all three items in the center of a strip of seaweed. Wrap the seaweed around the fillings. 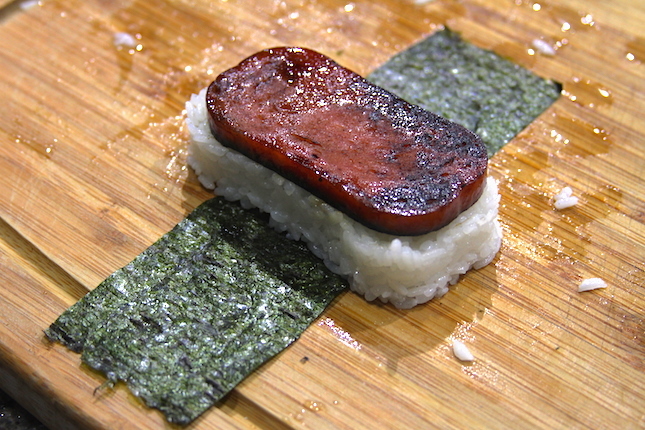 Wet the ends of the seaweed and place the seam on the bottom of the Musubi.